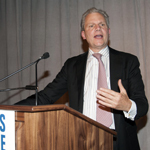 Remarks: Arthur O. Sulzberger Jr. Thank you Don. I am very grateful for your friendship, which has now extended over decades. You’ve been a mentor to me and I’m personally so delighted that the warm relationship your mother and my father established is kept alive by our alliance. Thank you for being here tonight and for helping to organize this wonderful evening. I am honored to accept this award tonight on behalf of my colleagues from The New York Times – past and present. Let me start with my great grandfather, Adolph Ochs; who set the tone when he bought The Times in 1896 and announced that he knew how to publish only one kind of journalism — that which was: “clean, dignified, trustworthy and impartial.” He passed these values down to his descendants by establishing The Trust that still controls and guides our paper today. And, my father — Punch Sulzberger. His decision to publish the Pentagon Papers in 1971 helped to extend access to critical information and prevent government censorship and intimidation. And, even earlier he led the fight that established the actual malice standard in the landmark case, The Times v. Sullivan in 1964. He was an absolutely fierce defender of freedom of the press. But primarily I’m here tonight because of the exceptional work of some of the finest journalists in the world, the men and women of The New York Times. There are too many names to mention them all, but a few stand out. James Risen, who, as you all know well, is in the middle of a lengthy and troubling legal battle with the federal government for protecting his confidential source. David Sanger, whose ground-breaking story on the Iranian Nuclear Program has resulted in yet another investigation of alleged national security leaks. Jill Abramson; a powerful and outspoken advocate for a free press. She has been one of the most forceful voices in challenging the secrecy of the Obama White House and their initiation of a record number of criminal leak investigations. I will always admire Jill’s commitment to this issue and be grateful for her many contributions to Times journalism. And finally, Dean Baquet, our new executive editor who not only shares these values, but is a driving force in our newsroom behind deep investigative reporting. In closing, I also want to congratulate my fellow honorees and thank this organization, the Reporters Committee for Freedom of the Press. Regrettably, we need you now more than ever — and not just here, but around the world. Journalists continue to risk their lives in the furtherance of our democracy and the world’s greater good. There is no nobler mission than to protect that right to gather and distribute news. And, as long as there are impediments to doing that, we need you very much.